Solder Cup High Density D-Sub connectors are a popular interface for many I/O applications. Offered in 15, 26, 44, 62 and 78 positions, they are a good choice for a low cost industry standard high density connection. High Density d-sub I/O connectors offer substantial space and weight savings to PCB design engineers. Compared to the equivalent standard density D-Sub connectors, a savings of 40% in space and over 100% in weight can be achieved. The stamped and formed solder bucket high density versions conform to commercial industry standards and will mate with any opposite gender high density D-sub from other manufacturers. Machined pin versions offer higher quality, higher amperage ratings and upwards from 200 mating operations. Tinned and dimpled d-sub connector shell as standard for enhanced electrical continuity and effective EMI/RFI shielding. Threaded inserts – enable quick assembly of mounting hardware to 90 degree p.c. versions. Solder bucket, straight p.c. 90 degree p.c. and crimp termination dsub connector styles – add user flexibility. Optional screwlocks and solderable boardlocks fitted to straight and 90 degree p.c. versions – reduced assembly time. Compatible with ‘standard d’ range accessories – lower inventory costs. All contacts simultaneously 3A @ 70°C Tamb. Working voltage 300Vdc or ac peak. Proof voltage 1000Vdc or ac peak. The DE15 layout is much used in VGA cables and has 15 pins, in three rows, in an E size shell. The 15pin High Density D-Sub connector can carry the standard VGA- RGBHV video signal plus RGBS, RGB sync on green and Component Video (Y/Pb/PR) providing the 15pin D-sub connector sockets have been wired for the purpose. The McMurdo range adopts the American topology of connectors with this pin spacing with the addition of the prefix “H” i.e. HDE15, HDA26, HDB44, HDC62, and HDD78. 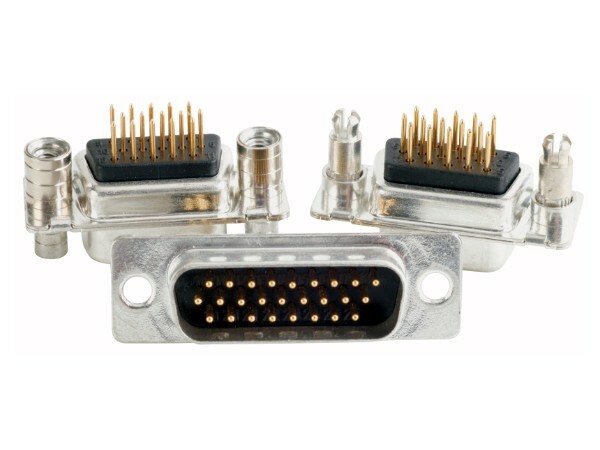 Alternatively, many D-sub connector buyers call the entire range “DB”; so these connectors are often called DB15HD, DB26HD, DB44HD, DB62HD, and DB78HD, where the “HD” stands for “high density”. They all have 3 rows of pins, except the HDD78, which has 4. Part numbers like the HDEX15SNT connector, 15 way right angled socket with built-in board locks and female jack posts enable CEMs worldwide to save both installation time and cost of inventory. RoHS compliant and suitable for mass soldering techniques like wave or reflow, you’ll never be far from a McMurdo High density d-sub. In2Connect stock product from ITW McMurdo and Conec as well as our own-brand In2Connect range. A choice of four high density d-sub termination styles including crimp are available making this range one of the most versatile, but if not in stock then a minimum order value may apply.